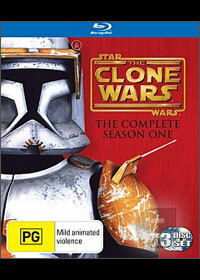 For Star Wars aficionados, Star Wars:Clone Wars needs no introduction. For the rest of the casual Star Wars followers, this animation, set in the Star Wars universe, follows the conflict between the Galactic Republic (with the help of the Jedi council) and the Separatists. It is designed to fit in between Star Wars Episode II (Attack of the Clones) and Star Wars Episode III (Revenge of the Sith). It continues on from where the mediocre Star Wars: Clone Wars film left off - Chancellor Palpatine is in charge of the Senate, the power of the Separatists under Count Dooku is slowly rising. Anakin, Obiwan, Yoda are back and also, Anakin's Padawan, Ahsoka, introduced in the aforementioned film, makes a welcome return (perhaps unwelcome for some fans). After the abysmal Clone Wars animated film, the Clone Wars series has surprised many fans with its superlative animations, its deep characters and enjoyable storylines. The episodes are varied, and serve as a filler in the Star Wars timeline, charting Anakin's continual movement to the Dark Side under Obiwan's guidance, the treachery of Palpatine, the evolution of Ahsoka into a Jedi warrior and the continual attempts of Count Dooku (with the leader of his Armies, General Grievous and Apprentice Ventress) to thwart the Republic. Note the return of Jar Jar Binks in a few episodes too. The production values are huge on this series as can be seen by gawking at the character models and the lush backgrounds all in 1080p and experiencing the thundering Dolby Digital 5.1 sound. The animation is clear, fluid and highly detailed. The attention to detail in each frame is amazing and even non Star Wars fans can enjoy the realism and style of this series. This can gets even more evident when the action takes us to new planets, where painstaking effort was expended in creating the unique fauna and flora - one of the first worlds visited is a coral planet and one of my favourite scenes is when Yoda is walking through a coral forest (the light passing between the coral and casting shadows on the ground is so beautifully rendered). The audio is powerful, utilising all channels and the music encompasses new and familiar Star Wars themes. The plots are well written and ample attention to detail was paid to character development and perpetuating existing behaviour. A Blu ray with just the series on it would satisfy even the hardest Star Wars fan, but the extras are something else too. Coupled with usual subtitles and audio in several different languages, each episode also has a featurette attached where different crew talk about making the episode. This gives a viewer a sneak peek into the exhaustive development of the episode and allows them to see different scenes at different stages of completion - from wire frame, to 3D models, to sound capturing, to plot development. These featurettes are compelling viewing. While watching them, a symbol will appear periodically which allows you to explore deeper the current concept being discussed. For example, when the crew are talking about the Toydarian king, the viewer can press Enter and view a 3D model of the King. At another moment, the viewer can press Enter and view the character sketches. To have featurettes for each and every episode is a total bonus. Also, the viewer can select to view the Jedi Temple Archives - basically a large repository of Animation, Concept Art and 3D models in the development of each episode. The Blu Ray also contains a Production Journal booklet containing sketches and Artist's notes during the production of the series. (A lot of the sketches even have the "Plo Kool!" approval stamp still on them.) The Jedi Temple archives plus the Production Journal allows the viewer a unique insight into the enormous detail involved in production. There is just so much extras to go through here - to watch, to examine and to admire. Star Wars:The Clone Wars Season 1 amply demonstrates the power of Blu ray in being able to pack in so much. There are not only the superb episodes on this disc but also so many well-made featurettes and extras. I have no hesitation in recommending this to all the Star Wars fans out there and they would do well to go pick this up right now.